Flying with Lufthansa this week? Well, good luck. Germany's biggest airline was forced to cancel nearly 1,000 flights on Monday due to the biggest strike in the company's history. Lufthansa's cabin staff embarked on a week-long walkout over a pension dispute on Friday. The airline improved its proposal on Monday evening in a bid to end the damaging strike. The company said in a statement that overall offer was equivalent to a pay rise of 6%. 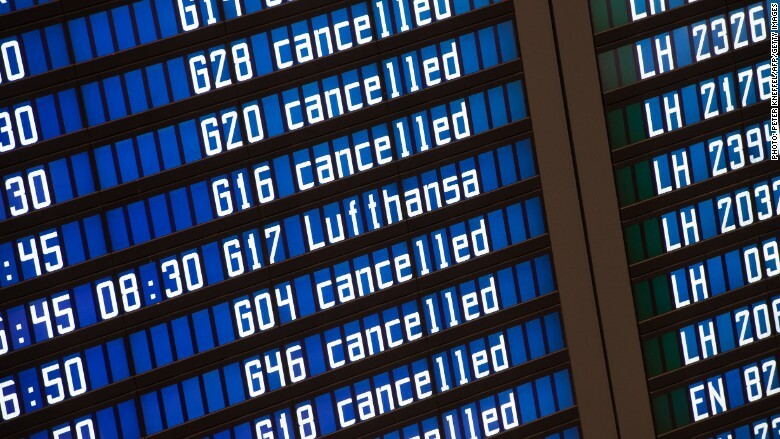 Around one-third of all Lufthansa's (DLAKY) connections were grounded Monday, leaving 113,000 passengers stranded. The flights were set to depart from its three main hubs in Frankfurt, Dusseldorf and Munich. The chaos follows strikes on Friday and Saturday, which left more than 800 flights grounded. The union and Lufthansa's management have so far failed to reach an agreement on pay and pension packages, the issue at the heart of the dispute. The airline is trying to trim costs, as it faces more competition from low cost carriers. It argues that its pension policies are too expensive and wants to reform them, for example by requiring crew members to work additional years before reaching current levels of pensions. The union wants the current system, which includes early retirement options and benefits packages, to stay unchanged. Related: Where is it safe for airlines to fly? The airline upgraded its 2015 earnings forecast last month, citing strong summer demand and low fuel prices. But it has warned that the "tailwind of low oil prices" may not last too long. It said it will focus on cost cutting to become more competitive in the tough European market. Lufthansa is still recovering from the blow that it suffered when disaster struck its subsidiary Germanwings in March. Germanwings flight 9525 was brought down deliberately by the plane's co-pilot, killing all 150 people on board. The airline faced a backlash from the victims' families, who called Lufthansa's compensation offer an insult, and complained that Lufthansa CEO Carsten Spohr did not speak to them directly. The airline is also facing a long-running dispute with its pilots, who have gone on strike several times in the past 18 months over the airline's early retirement packages -- an issue separate to the current dispute. Mark Thompson contributed to this report.